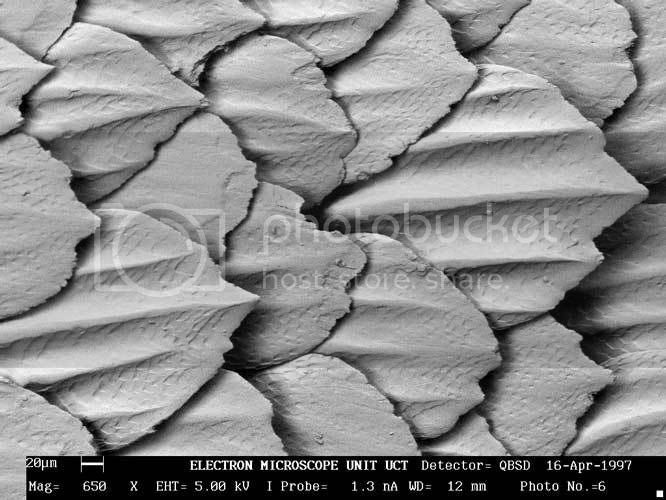 DIYEFI.org Forum - View topic - Biomimetics : Synthetic Shark Skin Texture for better flow? Biomimetics : Synthetic Shark Skin Texture for better flow? I wonder if such a thing could be engineered into the ports walls for a similar effect? 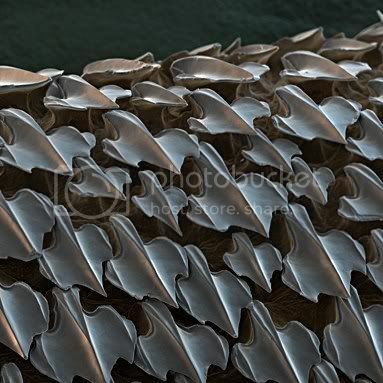 Re: Biomimetics : Synthetic Shark Skin Texture for better flow? saw this on discovery channel loooong time ago. I'd imagine if that'd help with flow efficiency, they'd endow planes with this long before ships. Yeah, I don't know how either. A LOOOOONG time ago I watched a show that said they were making synthetic fish slime for the same antifoul reasons. It never took off either. Planes and boats work a bit differently, that's why what helps the ship might not work with an airplane and vice versa. It's got to do with a bit obscure Reynold's number, a dimensionless value that has to do with inertia and viscosity and surface area and so on. It has a great impact on flow characteristics; a Boeing 747 and a moth live in the same medium, but where 747 needs sleek and streamlined parts to keep the flow smooth and undisturbed, moth observer the air like it was pea soup, it's sticky and flow well at all. The air passing over the low-reynolds surface will "stick", making a bubble of air that will increase drag and disrupt the flow. This can be overcome by energizing the air a bit by turbulators. This way the air will not stick, and the overall drag is reduced. Now, because water is a million times more viscous than air, these effects happen at much larger scale (pun not intended...) and that's why ships might benefit from it if planes wouldn't. There is a very common example of this phenomenon in use; the golf ball. The pitted surface works better than smooth. The engine intake works at slightly greater reynolds number than a golf ball, but I think it's worth investigating! But the golfballs dimples only help it because it's round. When you have a teardrop shape, such as most of the surfaces of an airplane, the dimples do nothing. actually, if you had a wing with similar reynolds to a golf ball, it would need turbulators to work correctly. In model aeroplanes it's customary to add ribs or dimples on the leading edge to improve performance, and in a NASA study about flying on martian atmosphere it was found the normal aerodynamic shape was far inferior to a shape that on earth would only work as a washboard on a full size aircraft. Aerodynamics depend greatly on the scale, and what is true and obvious on one condition might not be at all so in other. Do not think otherwise.